The art and culture festival the Culture Night, which is to take place on the night from July 5 to 6 this year and be the main cultural event marking the start of Lithuania’s Presidency of the Council of the EU, invites Vilnius residents and guests to attend 165 projects prepared by Lithuanian and foreign artists. ‘This year’s programme is the largest we’ve ever had, so everyone is guaranteed to find an event of interest to them. This year, we concentrate our programme on Europeanism and cross-country cooperation and invite people wandering about the streets of the city to attend events by artists from abroad, such as “Piano Migrations” by British artist Kathy Hinde , the installation “Purple Rain” by a group of French artists, amusing street clowns from Spain, the exclusive show “Carmen” by the Georgian Dancing Theatre, and also a number of projects by foreign embassies and institutes,’ says Daina Urbanaviciene, the initiator of the Culture Night. Along with artists from abroad, a large array of Lithuanian artists will also present their projects. Children will be invited to the Family Area in the Sventaragis Valley, with ‘The Fairy-tale’ by Teatriukas, a theatre performance about love by Clown Doctors, lots of games organised by the Toy Museum, face painting activities, and other entertainments waiting for them. 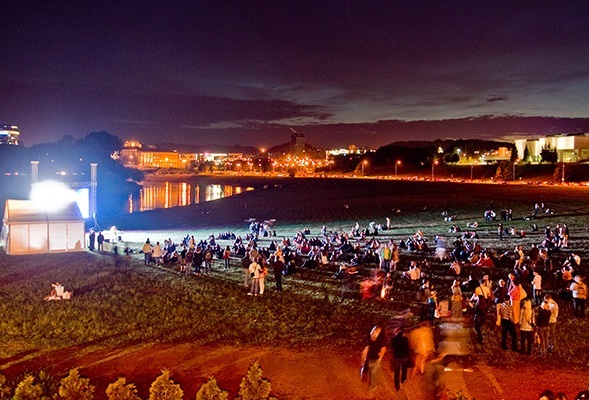 Festival visitors will enjoy an impressive programme by the Arts Printing House, ‘Cinema on the Grass’ near the White Bridge by Cinema Spring (or Kino Pavasaris in Lithuanian), a piano music concert by Petras Geniusas at Lukiskes Square, which has already become a tradition, a concert by Domantas Razauskas in the Rotonda café reborn for one night. Artists participating in the festival come not only from Vilnius, but also from Kaunas, Klaipeda, Panevezys and other cities. The project is also joined by a number of educational institutions (including Vilnius Academy of Arts, Vilnius University, Vilnius College of Design), with students preparing exhibitions, light installations, and other projects. A lot of Vilnius’s museums and galleries will be open during the Culture Night, with even two performances of ‘Hourglass’, a joint project of Lithuanian and foreign artists that has already attracted interest abroad.